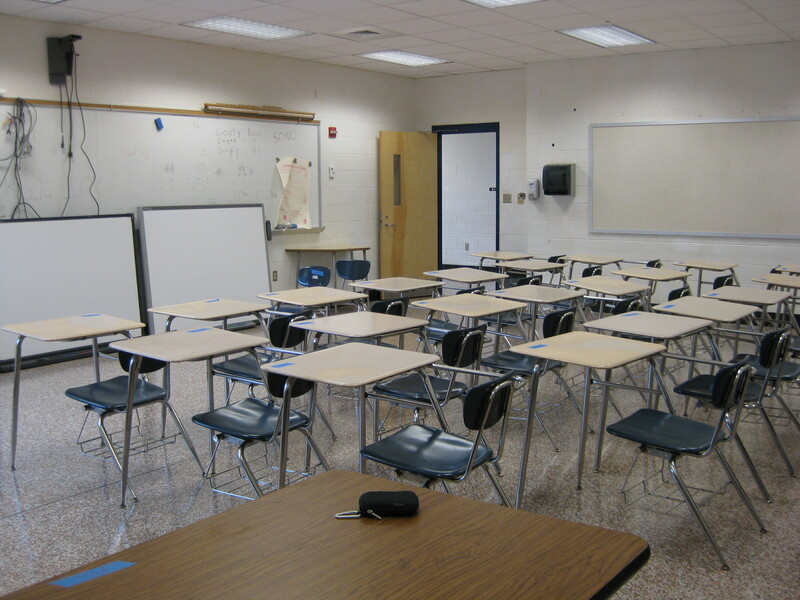 Classroom 2013 | Go to Sleep. Study. Mathinate. It’s year 5 in the same classroom and this is the first year I’ve ever felt really organized at the beginning of the year. We’re three weeks into the year and my room still looks pretty organized; I’ve been making a serious effort to not let things get behind or for the papers to get piled up. 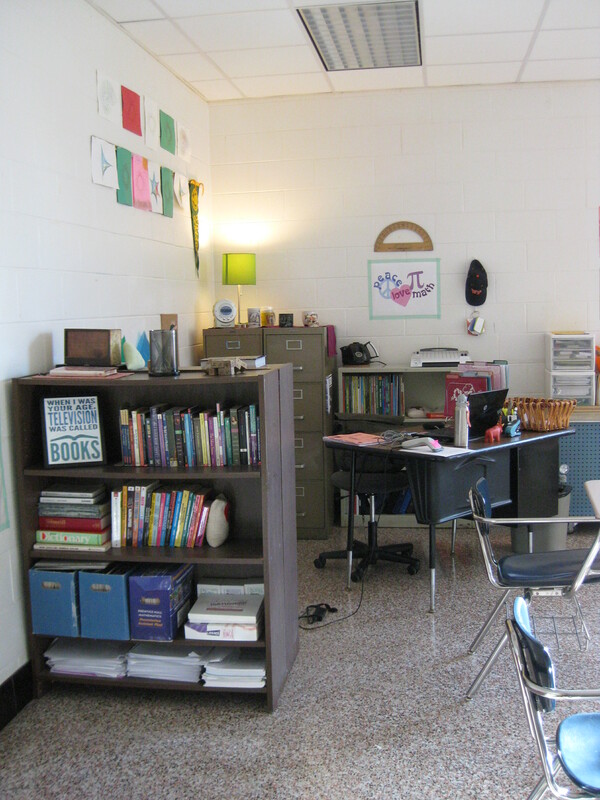 When I first got back in August, my room was mostly a blank slate. 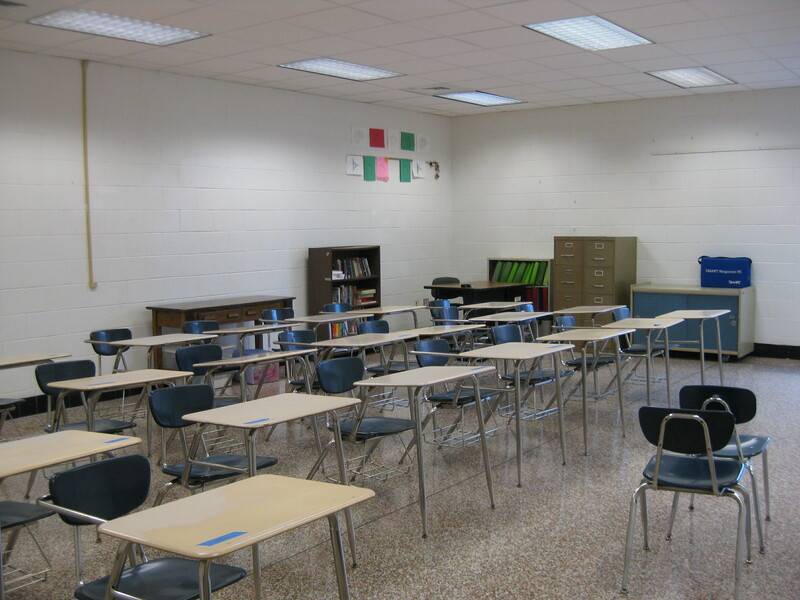 The school just had some major work done, so most of the furniture was just returned the day I got back, and everything I liked had come home with me for the summer. I have an extra bookshelf this year, which is great because I was overcrowded before. 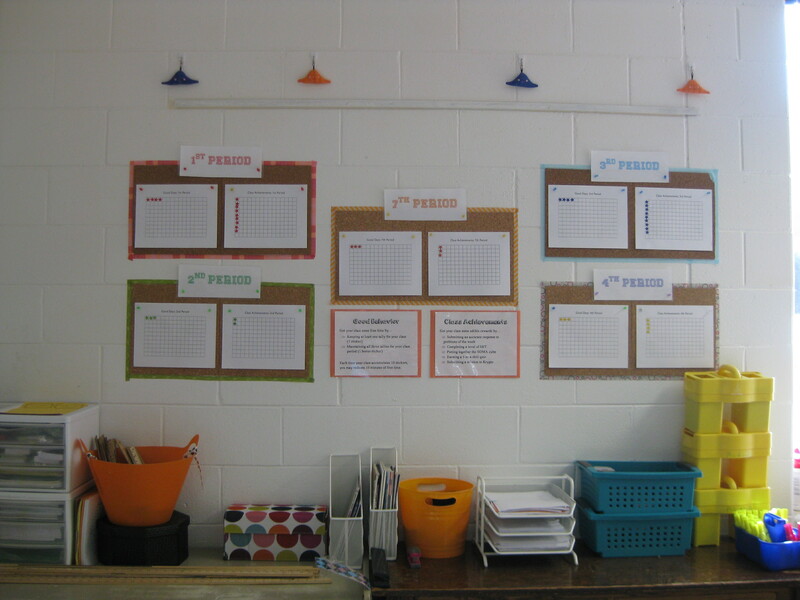 I still haven’t hung anything on the cork board behind my desk, but I use those plastic files to sort unfinished quizzes by class period. I also plan on actually using my hot water kettle (a gift from my grandmother) to make tea this year. Also nearby: my laminator. I’m enamored with it and I have the MTBoS to thank. I’m also excited about finding a paper sorter (left in one of the lockers last year), so I’m using it to sort my colored paper and upcoming papers for the week (assuming that I can actually copy them a few days in advance). I’m also really happy with how my bulletin board turned out. 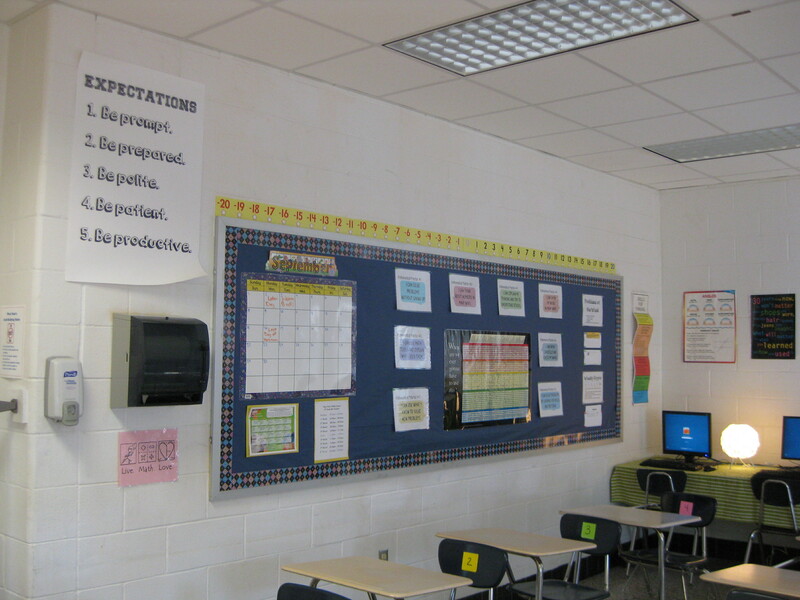 The main feature is the “When are we ever gonna have to use this?” poster, which another teacher-friend of mine had last year, so I got one, too. This poster is bordered by the wonderful Mathematical Practices set from Everybody is a Genius. To the right of the posters is the Problem of the Week / Weekly Krypto area for students who finish early. This was taken before I used washi tape to border the Expectations poster. It kept falling down. 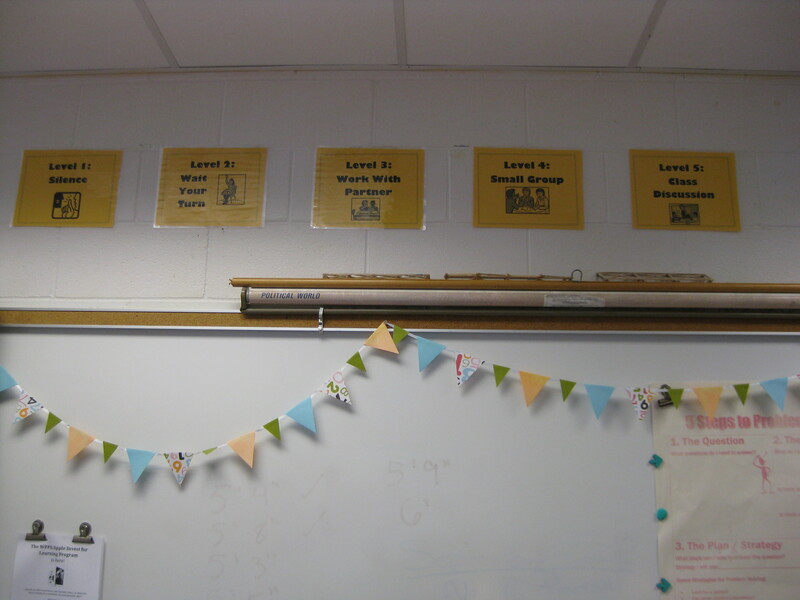 On the other side of the room, I’m keeping supplies and the class rewards systems. 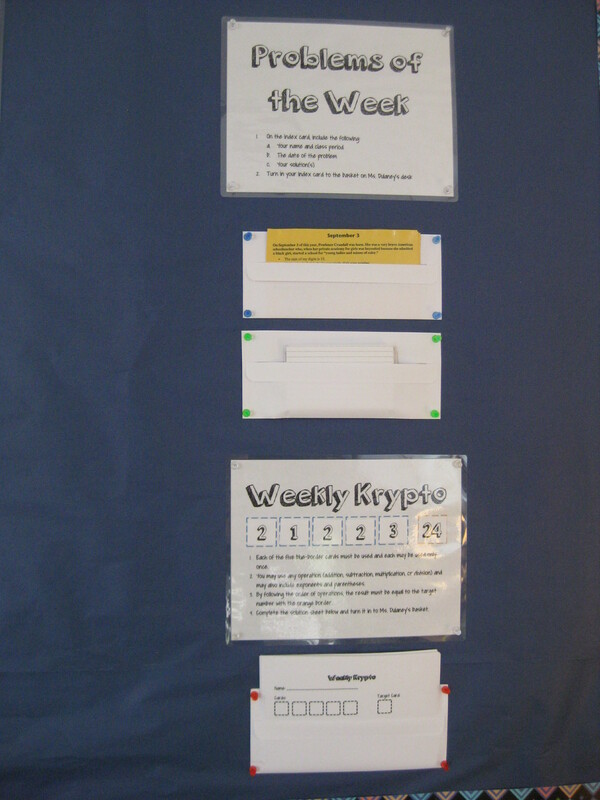 There are two: one for behavior (10 stickers = 10 free minutes one day after a lesson is finished) and one for achievements, like putting together the Soma cube or solving Krypto (the most stickers at the end of the month = cookies for the class). All the classes are sorted by color. 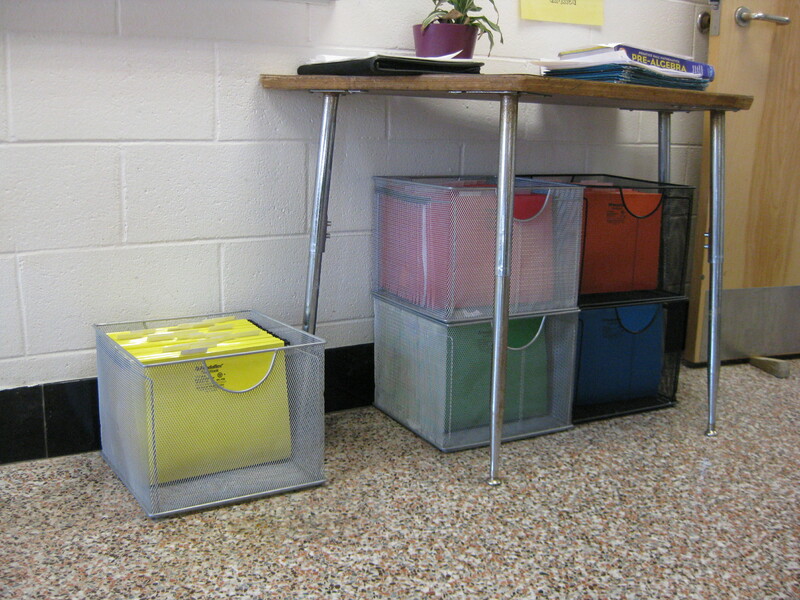 Each class also has a file crate; each student has a hanging file. This is where they keep their warm-up folders. 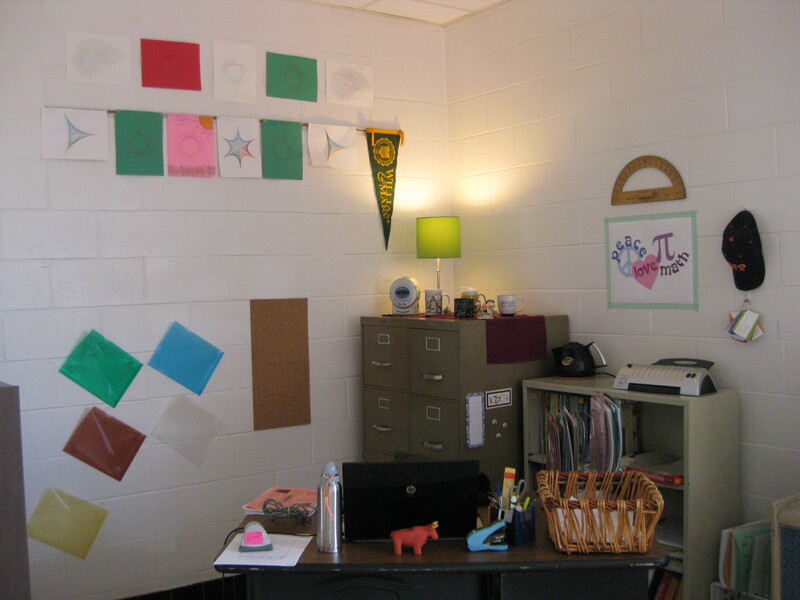 It’s also where I return exit tickets and quizzes (otherwise all the papers pile up somewhere and it takes too much class time to pass them out individually. This is one of my Pinterest-inspired areas. I haven’t explicitly gone over this year but I’m hoping the students read them when they go to their files at the beginning and end of class. More Pinterest inspiration. I’ve only referred to it a few times and I need to get better at it. 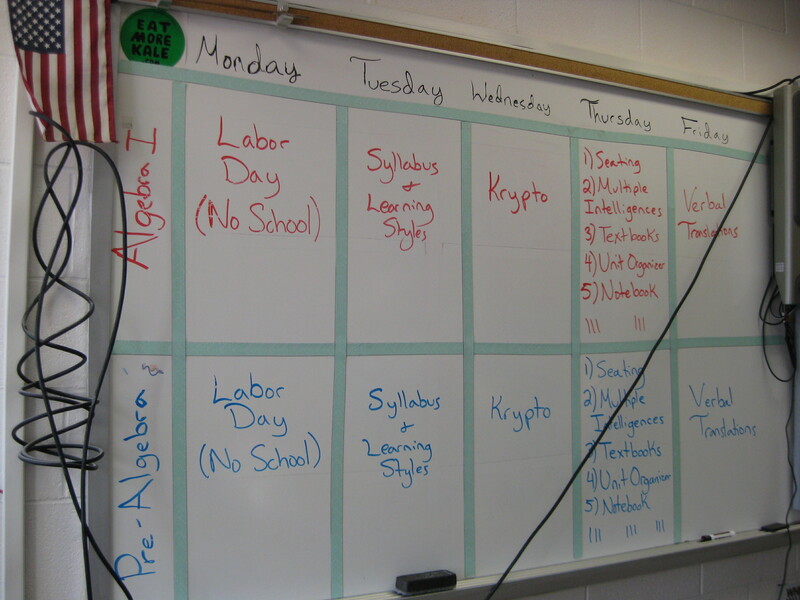 My whiteboard, to the left of the Smart board is the schedule for both types of classes. The current day is detailed and the other days are just overviews. 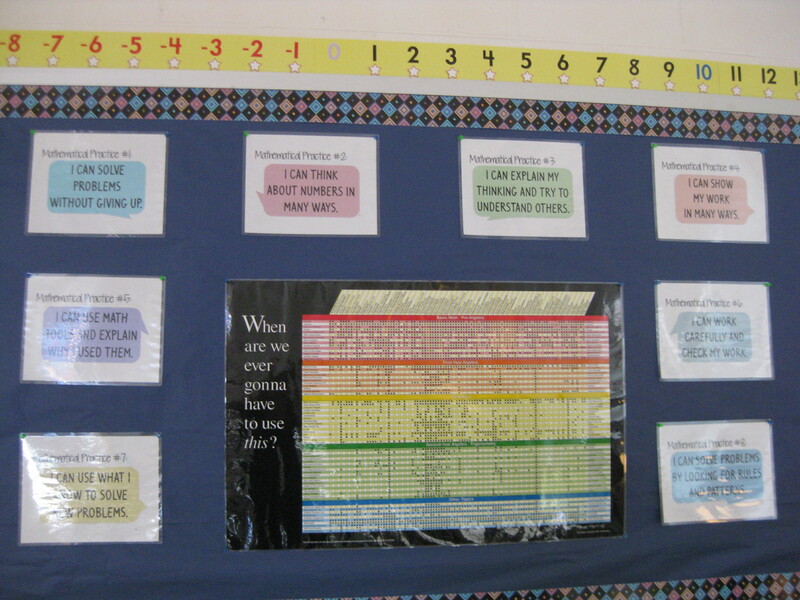 The tallies are for the class behavior stickers – keeping all three earns 2 stickers, keeping one or two earns 1 sticker. These posters are partially decoration, partially covering holes in the wall. 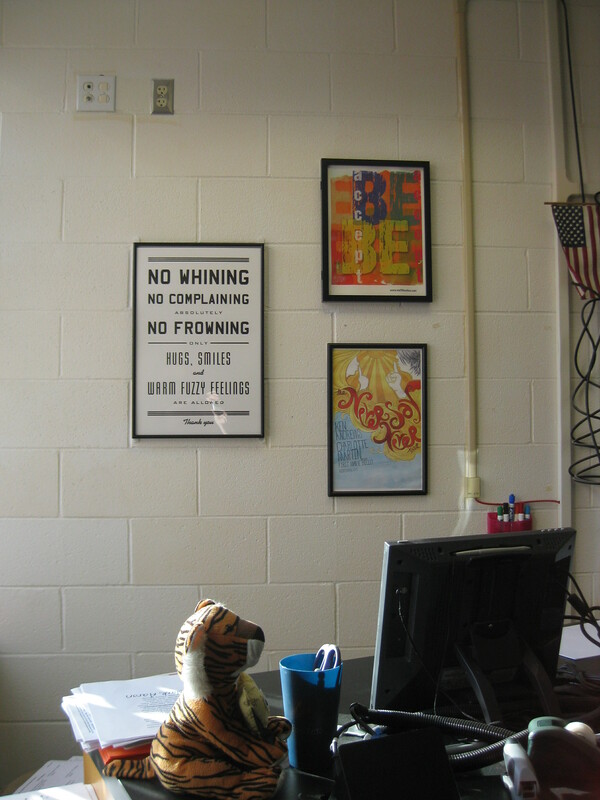 The No Whining poster came from Urban Outfitters and, oddly enough, the poster is more effective than me saying it over and over. I bought the Accept and Be poster back when CB2 was selling them in 2012, thinking that it would be a great message. The Never Say Never poster is mostly to represent my love of Char Mar, but I also like the message of not giving up. Though, I usually just get asked if it has to do with Justin Bieber. I love getting natural light in through the windows, but since my view includes students entering and exiting the building (distractions abound! 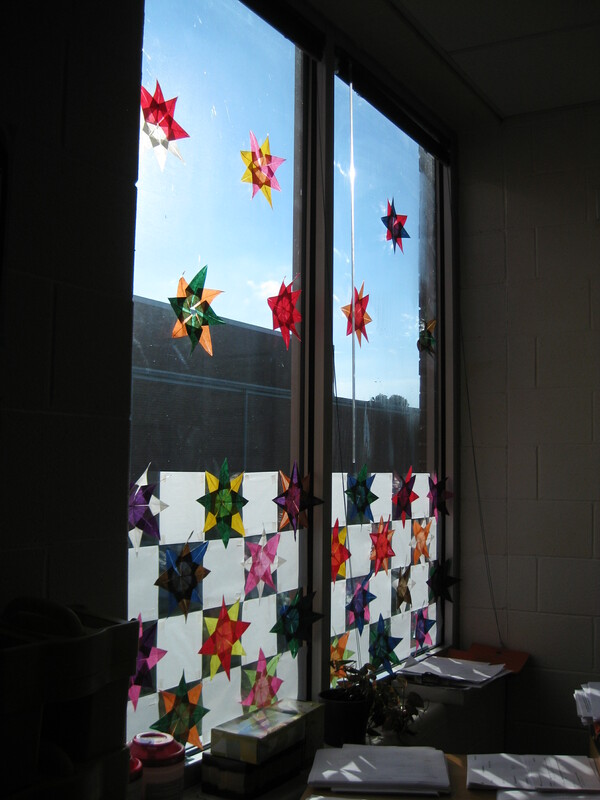 ), I hang up these window stars to cover up the lower part of the window. We make the window stars every year after the SOL test and I keep the ones that no one wants to take home. 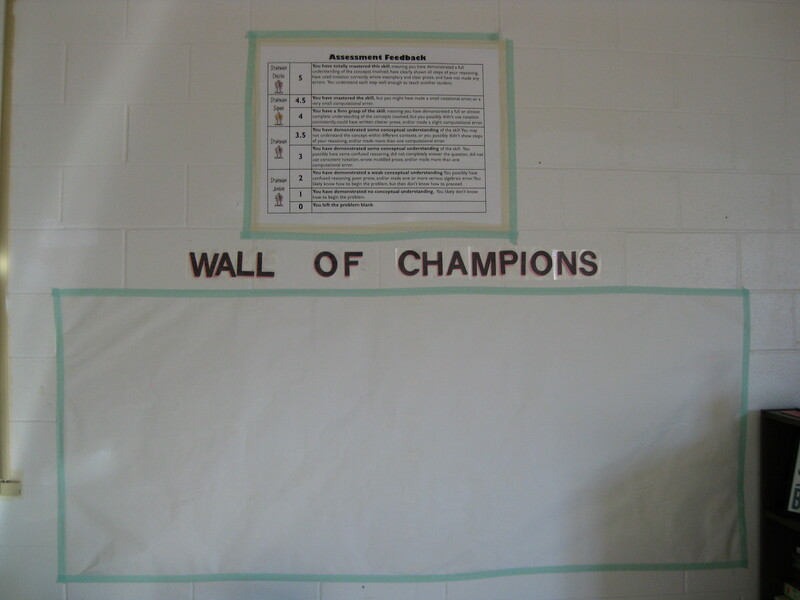 Finally, I’ve set up my own wall of champions! 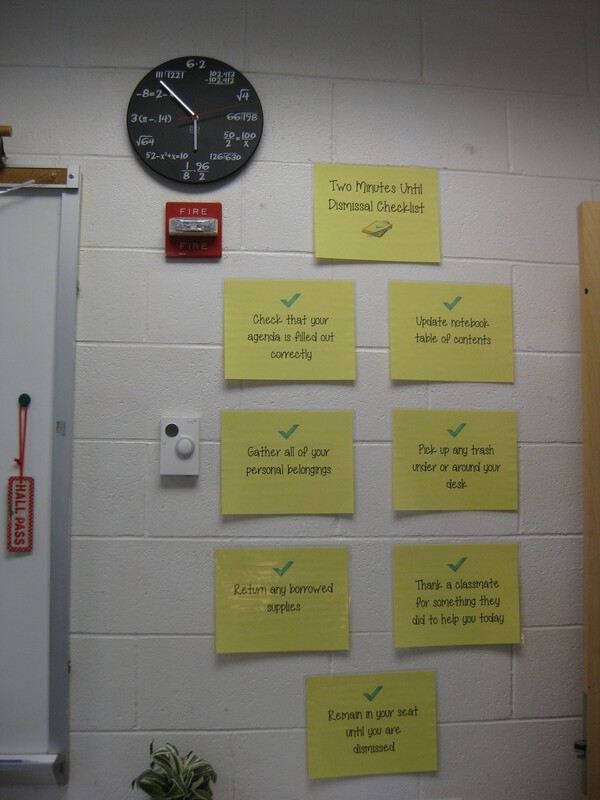 This was taken before the first quiz, but now it’s adorned with many sticky notes (also color-coded by class). 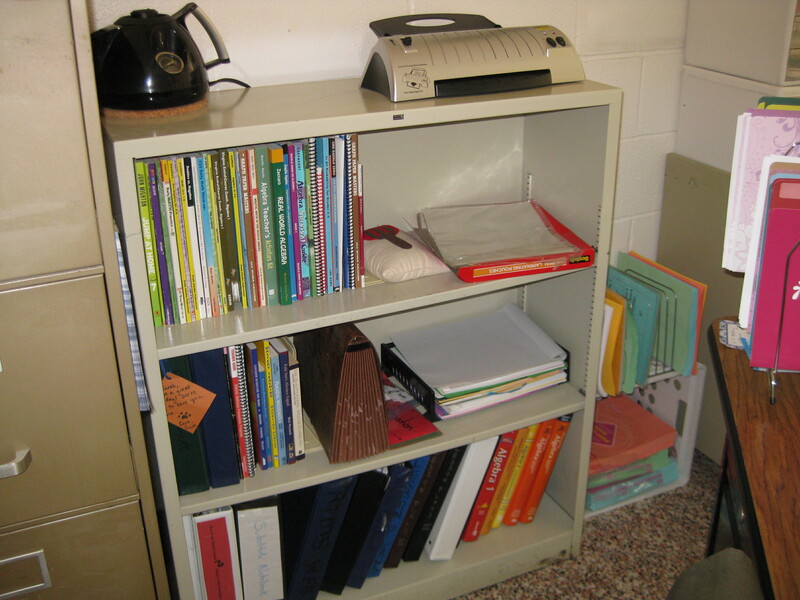 Hopefully the cheerful colors and organization will help make this year a successful one.